A small reconnaissance team based in the Hidden Valley area on Gunung Api, searching for new entrances observed from helicopter video footage. A larger group based at Camp 5 in the Melinau gorge, continuing exploration of Whiterock cave (part of the Clearwater Cave system) and other sites under Gunung Api and Gunung Benarat. A small group carrying out high resolution 3D laser scanning and further scientific study of the geomorphology of Sarawak chamber and Api chambers. The team was comprised a total of nineteen members from the UK, Australia, Germany, Denmark plus our hosts at Sarawak Forestry. 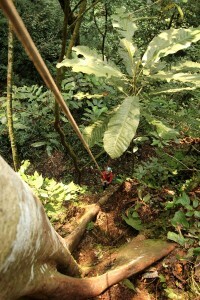 The expedition was greatly assisted by National Park Management, staff and local people. A five man team spent 17 days in the Hidden Valley. The main objective was a cave entrance 200 m up on the north side of the valley, which was named Conviction Cave. 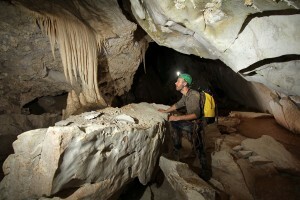 This cave subsequently connected with Wonder Cave which had been explored on expeditions in the 1980’s and 1990’s. Extensions were then made in a northerly direction under the summit of Gunnung Api, with over 1.5 km of new passages surveyed. The length of the Wonder/Conviction Cave system is now close to 7 km. The Conviction entrance is now the highest in the park at 680 m above sea level. 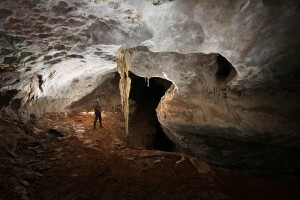 The cave is now the deepest underground from the surface at -1.3 km. 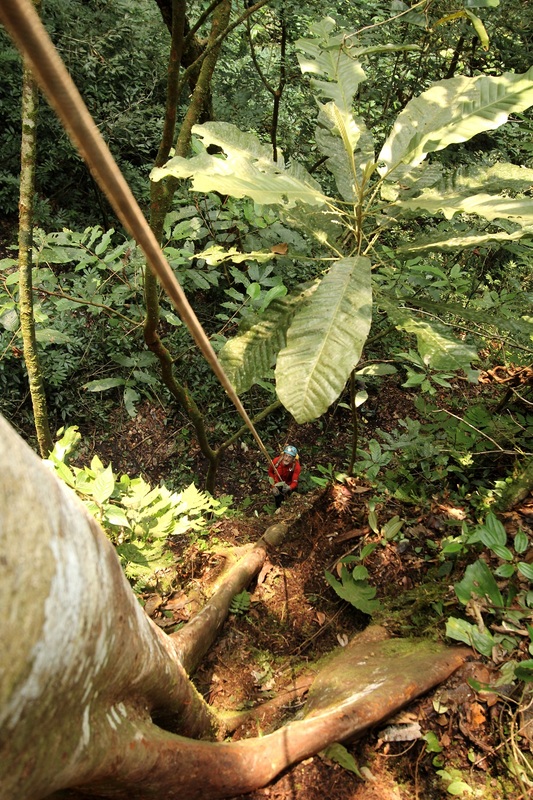 Teams followed up leads from previous expeditions; exploring, surveying and photographing a significant number of new passages in existing caves and locating some new entrances from surface searching. In total the team surveyed 8.2 km of new passages. The survey work was carried out in a very accurate and detailed manner, as numerous interconnections from known passages were found. Some use was made of the digital DistoX devices and “in cave” drawing on a Personal Digital Assistant device via “Pocket topo” software. Most of the newly explored and surveyed passage was in Whiterock Cave, part of the Clearwater system in Gunung Api. A technical climb from “Apprenticeship Passage” on the Western side of Whiterock Cave entered a horizontal level 100 m higher than anything previously found in Whiterock, named Firestorm passage. Unfortunately, surface erosional features are found to be breaking into this new passage in numerous places so it is limited in its extent. Passages at high level further east, where there is a greater height of limestone above, are now thought to hold more potential for future discoveries. Another significant extension was made in the central northern area of Whiterock; the Medusa Series, leading on from the Strong Hint of Bigness Passsage, first explored in 2007. In the southern part of the Whiterock system, various areas of surveying created a much more complete picture of the layout of cave passages around the Bigness South and Big Issue passages. The team also assisted the 3D laser scanning team with accessing Api Chamber, at the extreme southern end of the Whiterock System. The total added to Whiterock was 8km, which has increased the total length of the Clearwater system to 214 km. Clearwater remains at 8th place in the World’s longest cave rankings. NB – the lengths will be confirmed in the final expedition report. The main emphasis of this year’s fieldwork has been on photographic and laser survey of Api and Sarawak Cave chambers, and on cavern stability and breakdown. The photographic work provides visual images for co-location and scientific interpretation, and also for colour rendering of laser models, for instance for ‘fly through’ visualisation. 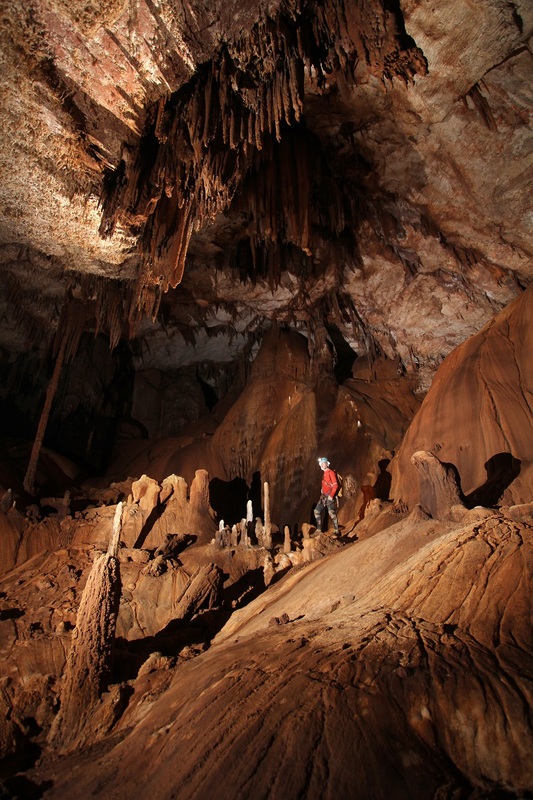 High resolution laser scanning and large scale photography was undertaken in Sarawak Chamber, Nasib Bagus Cave. A total of 101 stations were surveyed (compared to only 9 in the previous laser survey), greatly improving coverage in prior ‘shadow areas’ including the Prediction Cave and Stream Inlet passages. The new survey increases the area of the main chamber to 163 x 103 m2 compared to the previous estimate of 154 x 103 m2, and increases the overall volume to 9.81 x 106 m3. The survey also covered the outlet passage from the chamber portal to the streamway, which if included as part of the chamber would increase the volume to 10.5 x 106 m3. This figure is however still just less that that of Miao Chamber, China, currently recognised as the World’s largest cave chamber by volume. Samples of speleothem were collected with a wide distribution in the chamber, and supplement previous limited samples. These included flowstone coating boulders, stalactites and flowstone from rotated floor blocks and fallen stalactites from the roof. There is a general increase in speleothem abundance from the south to the north of the chamber. The latter may show spatial patterns in the timing of roof failure. Remarkably, breakage of encrusting flowstone and toppling of larger stalagmites is extremely rare, suggesting a high stability. The latter is of course increased by the cementing effects of the secondary calcite on the breakdown boulder floor. This contrasts markedly with the southern parts of the chamber where active evacuation of shale debris is occurring. 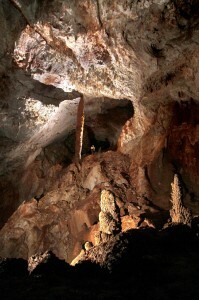 High resolution laser scanning and photography was also undertaken in Api Chamber, Whiterock Cave. A total of 81 stations were surveyed, including 10 in the approach passage. The latter give an indication of the size of the boulder pile which underlies the chamber and also the much smaller size of the passages which on amalgamation have formed the chamber. The laser survey shows that the roof in the central part of Api Chamber is over 200 m from the floor, much greater than previous estimates. The chamber volume is thus rather larger than had been previously assumed, our preliminary estimates suggesting a volume of 2.6 x 106 m3, which would place Api Chamber 8th in the World list by volume. The floor area is 56.7 x 103 m2. This is considerably larger than the previous estimate of 38 x 103 m2. Figures are all preliminary estimates and subject to revision. The Hidden Valley team have proved that cave extends NE from Wonder Cave, under Gunung Api, at higher altitude than any other cave in Mulu. This extension is into a large area of limestone, with no previously known cave passage. The discovery suggests passages could go right under the summit of G. Api, through this area, to the Melinau gorge. If the eastern part of Gunung Api is eventually found to have the same density of cave passages as the Clearwater Cave area, then several hundreds of kilometres of cave exploration and surveying could await the next generation. The Camp Five team explored and accurately surveyed numerous cave passages in the complex Whiterock Cave, to further extend the world class Clearwater system. The scanning team produced a highly detailed scan of Sarawak and Api Chambers, giving volumes that prove their rankings in the top ten largest chambers in the world. The scans also provide a wealth of information on the structure and geomorphology of the chambers and potential new sites for exploration. The scientific work will continue to provide new information on the geomorphology and ages of the caves, past climate reconstruction, and geochemistry of the sediments. The teams also identified and recorded a good number of underground and surface leads for future expeditions to continue with.